Texas Republican Lamar Smith, chairman of the House science committee, wants to make it more difficult for the Environmental Protection Agency to do its job. Americans consistently support environmental safeguards by wide margins. A survey of likely 2016 voters, for instance, found that 91 percent of Americans endorse strengthening drinking water and air pollution protections, 87 percent want expanded renewable energy development, and 82 percent would like the government to place limits on power plant carbon pollution. Despite those numbers, industry-backed legislators in both houses of Congress have been introducing -- and reintroducing -- benign-sounding bills over the last few years that would do the exact opposite of what a solid majority of Americans want. The sponsors of these Trojan Horse bills claim they would increase accountability and transparency, but in fact they would obstruct the Environmental Protection Agency (EPA) and other federal agencies from enacting science-based rules, setting back public health and environmental protections for decades to come. Three of the four bills have already passed in the House, and three have been introduced in the Senate, where they died in previous sessions. If a Senate sponsor attaches any or all of them to an omnibus or must-pass budget bill this session, however, they just might elude President Obama's promised veto pen. The result? They would tie up federal agencies with bureaucratic red tape, limit the data they could use, deter independent scientists from participating, and give corporations even more influence over the rulemaking process. "These bills are based on a set of false premises concerning the science advisory process for federal agencies," said Andrew Rosenberg, director of the Center for Science and Democracy at the Union of Concerned Scientists (UCS) and lead author of a May 29 Science article on congressional attacks on science. "Let's be clear about what's happening here: Special interests find the Clean Air Act, the Safe Drinking Water Act, and other laws that protect public health and safety inconvenient, so they're attacking the science to roll back those protections." Perhaps the broadest assault on federal agencies is the proposed Regulations from the Executive in Need of Scrutiny (REINS) Act, which would give Congress the final say over major regulations. The bill would require Congress to approve any new or updated regulation with an annual economic impact of $100 million or more, giving both houses of Congress 70 business days to approve the rule. If either failed to act, the agency would have to wait until the next legislative session. The House passed the REINS Act in 2011 and 2013, but it languished in the Senate. In January, Rep. Todd Young (R-Ind.) and Sen. Rand Paul (R-Ky.) reintroduced the bill in their respective chambers. Paul claims the bill would hold agencies accountable by "cutting red tape and opening the regulatory process to scrutiny." In fact, the bill would only serve to create more red tape for agency scientists and analysts -- who are relatively insulated from outside pressure -- and undermine their ability to make regulatory decisions. The fate of a wide range of rules would instead rest with politicians, who are too often beholden to special interests. How would Paul vote on a proposed power plant air pollution standard, for example, when he gets generous financial support from oil and coal behemoth Koch Industries and coal giants Alliance Resource Partners and Murray Energy? Or how would Young, who gets significant funding from building and construction companies, vote on a rule to strengthen the Clean Water Act? Given the extent of corporate influence and current gridlock on Capitol Hill, science-based public health and environmental protections would likely die a quick death if this bill becomes law. Earlier this year, the House passed a bill that, according to its sponsor Rep. Bob Goodlatte (R-Va.), would increase government accountability by requiring "agencies to choose the lowest cost alternatives that meet statutory objectives and improve agency transparency and fact finding." Wonky language aside, at first blush, that sounds pretty good. A closer look at Goodlatte's Regulatory Accountability Act, however, reveals that it would slow an already sluggish rulemaking process to a crawl and make it easier for legislators to weaken and block public health and environmental protections. How? By imposing more than 70 new procedural requirements on federal agencies and giving polluting industries more opportunities to challenge proposed rules. It also would force agencies to adopt the cheapest option for new safety measures, even when it is less protective. "This bill rigs the regulatory process against new public safeguards and provides industry special interests a blueprint for killing new health and safety standards in court," Amit Narang, a regulatory policy expert at Public Citizen, told The Hill. "It is a giveaway to big business by forcing agencies to adopt the so-called 'least costly' regulation, but one only has to look to Wall Street reform to understand that the least costly rules for Wall Street end up being the most costly for American taxpayers." It's not surprising that Goodlatte would sponsor such a bill. According to the League of Conservation Voters, he voted against protecting the environment 92 percent of the time since taking office in 1993. That track record no doubt keeps his major campaign contributors happy, especially the agriculture, electric utility, and oil and gas companies that together donated more than $250,000 to him since 2011. In mid-March, the House passed a bill that would place limits on independent scientists advising the EPA about their own research. You read that right. At the same time, the bill -- titled the EPA Science Advisory Board Reform Act -- specifies that experts with financial ties to corporations that could be affected by advisory board assessments would not be excluded from participating. The bill's sponsor, Rep. Frank Lucas (R-Okla.), says the bill's goal is "guaranteeing a well-balanced expert panel, increasing transparency, and encouraging public participation." Well-balanced? If passed, the bill would "likely increase the number of conflicted board panelists empowering companies to delay the board's work for years, if not decades," said UCS's Rosenberg. "Academic scientists who know the most about a subject wouldn't be able weigh in, but experts paid by corporations who want to block regulations could. This turns the idea of conflict of interest on its head, with the bizarre presumption that corporate experts with direct financial interests are not conflicted while academics who work on these issues are." Packing the EPA's Science Advisory Board with corporate scientists would undoubtedly benefit the companies that give campaign contributions to Lucas and Sens. John Boozman (R-Ark.) and Joe Manchin (D-W.Va.), who introduced the same bill in the Senate in late February. Lucas' top two industrial sector supporters are the agriculture and oil and gas industries, which have given him $1.65 million and $569,000 respectively over his 20-year House career. Boozman, who won a Senate seat in 2010 after serving in the House for nine years, counts Koch Industries, Murray Energy and Big Ag's Cargill, Monsanto and Tyson Foods among his top campaign contributors over the last five years. Manchin, meanwhile, gets major support from coal mining companies and electric utilities. Together, they gave him more than $1.12 million since 2009, when he first ran for the Senate. 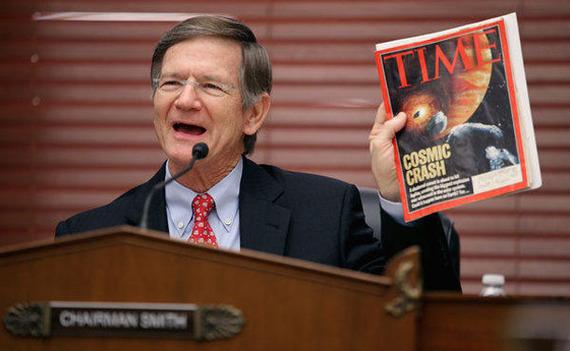 The House also passed Rep. Lamar Smith's (R-Texas) Secret Science Reform Act in mid-March to prohibit the EPA from implementing a regulation unless it makes public all related data, scientific analyses and materials. Sen. John Barrasso (R-Wyo.) sponsored the same bill in the Senate, and in late April, a Senate committee narrowly voted to approve it and send it to the floor. Smith claims the bill's intent is to increase transparency at the agency so that it can't use "hidden and flawed" science. In fact, the bill would severely hamper the EPA from carrying out its mission to protect public health and the environment, prompting more than 40 scientific institutions and universities to oppose it. "The legislation may sound reasonable, but it's actually a cynical attack on the EPA's ability to do its job," Rosenberg said in a statement. "This bill would make it impossible for the EPA to use many health studies, since they often contain private patient information that can't and shouldn't be revealed." Likewise, the bill would prohibit the agency from using confidential business information and limit the agency to only using scientific studies with "reproducible" results. Epidemiological studies of human exposure to toxic pollutants, for example, would not be admissible. Finally, the bill would drive up the EPA's costs at the same time some members of Congress are trying to slash its budget. The Congressional Budget Office calculates that the Secret Science Reform Act would cost the agency an extra $10,000 to $30,000 per scientific study. Given the agency relies on about 50,000 studies per year, it could saddle the agency with an annual tab of several hundred million dollars. Considering that Smith is chairman of the House science committee and Barrasso is a medical doctor, why are they promoting this bill? Perhaps it has something to do with the fact that, like the sponsors of the three other anti-science bills, they have close ties to industrial polluters. Smith's top patron during his nearly 30 years in office has been the oil and gas industry, including Koch Industries and Valero Energy, which has plied him with more than $610,000 in campaign contributions. Sure enough, Smith routinely cites the industry's talking points, questioning the role human activity plays in climate change, for instance, or that anything can be done about it. Barrasso, who also disputes climate science, likewise counts the oil and gas industry -- as well as electric utilities -- among his top five industrial sector contributors. Collectively the two sectors gave him nearly $859,000 over the last five years, and his two top fossil fuel funders were Koch Industries and Murray Energy. There's a good reason why a majority of Americans support strong public health and environmental safeguards: They provide considerable benefits that far exceed their cost. Take the Clean Air Act, which Congress initially passed in 1970 and strengthened in 1990 during the George H.W. Bush administration. The law requires the EPA to update pollution standards every five years to account for scientific advances in our understanding of the threat pollution poses to public health and how best to reduce it. Beyond a doubt, the law has been a resounding success. An October 1997 EPA cost-benefit analysis of Clean Air Act programs from 1970 to 1990 calculated the mean estimate of their public health and environmental benefits at approximately $22 trillion. The cost of achieving the pollution reductions, at $523 billion, was a fraction of the estimated benefits. An April 2011 EPA study, meanwhile, found that in 2010 alone, the decline in fine particle pollution and ozone pollution attributed to the Clean Air Act Amendments of 1990 prevented more than 160,000 premature deaths, 130,000 heart attacks, millions of cases of respiratory ailments, and 86,000 hospital admissions. On the economic side, the study projected that the benefits from the programs established by the 1990 amendments likely would exceed their costs by a factor of more than 30 to 1 in 2020. Regardless, the sponsors of the four anti-science bills now winding their way through Congress are making the same insidious calculation Clean Air Act opponents make. They focus on the cost of regulations and disregard their very real benefits. "It's true that industry has to bear some of the cost of public health, safety and environmental protections, because it is largely responsible for the damage," said UCS's Rosenberg. "But the benefits of cleaner air and water and better workplace and public safety are the reasons for the laws in the first place. And they have been substantial. If anyone would like to experience what some regions of our country would be like without the Clean Air Act, visit Beijing." Elliott Negin is a senior writer at the Union of Concerned Scientists. UCS intern DeAntre Bryant provided research for this article and all campaign contribution data came from the nonpartisan Center for Responsive Politics.